The climate in rain forests can range anywhere from 68 °F to around 93 °F. Because of the large amounts of rainfall, the humidity percentage is around 88%. 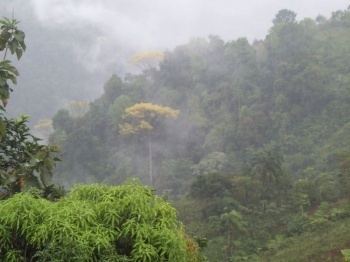 The rainforest usually receives approximately 100 inches of rainfall annually. On the other hand, tropical rainforests receive anywhere from 160-400 inches of rain per year. In one year, it is common in rainforests to have rain anywhere from 130-250 days per year. The Emergent layer includes a limited number of the tallest trees which inhabit the rainforest. Such trees are those who are able to grow to higher heights than the other trees encompassed in the canopy later. The average height of these trees ranges from approximately 45-95 meters tall. The trees in the emergent layer must be able to withstand high wind speeds as well as hot weather due to their location above all other trees. The canopy layer encompasses the masses of trees that are found in the rainforest. The average height of these trees ranges from about 30 meters tall to around 45 meters tall. The densest parts of the rainforest are found in this layer, due to the broad range of foliage that may be found on the variety of species. It is commonly thought that around 40% of the earth's plant species can be found in the earth's rainforest. Although there is a plethora of plant species may be found in the Canopy layer, approximately a quarter of all insect species can be found in this layer. Scientist, since 1917, have been exploring the possibilities of study the plant and animal life which hides in the trees of the rainforest. Although many have talked about such opportunities, few have actually been able to accomplish this task due to the problem of reaching the height in the trees which needs to be reached for proper analysis of life. A common way to reach the canopy layer is by firing ropes into the trees using a cross-bow. This technique was developed in the 1980's. The shrub layer or the undercanopy layer is located under the canopy. The leaves at this particular region of the rainforest are naturally larger than those in the canopy. Along with the canopy layer, many insect species may be found in this layer as well. Because only 5% of the sunlight which covers the canopy layer reaches the shrub layer, many plants are not able to grow due to the lack of sunlight. Note that though "adaptations" is a common evolutionist term, this paragraph is not referring to new genetic information that was not previously there. Biblical Christianity holds that all the genetic potential in the world's animals and plants would have had to have been in existence from Day 3 (in this case), save perhaps for viruses. Thus, the "adaptations" referred to are nothing more than the results of natural selection working on the rainforest trees, allowing them to utilize their genetic potential to "be fruitful and multiply" and "fill the earth." Adaptation, in this usage, means nothing more than the regular dictionary term. Rainforests, for hundreds of years, have been exposed to forestation, (logging and "agricultural clearance"). Because of deforestation, much of the land area that was once covered by natural rain forest has since been receding and decreasing. Many experts believe that because of this forestation, thousands of species every year are being deleted, killed, and nearly pushed to extinction. This issue has become one of the top arguments for wild life and environmentalists, which would like to protect the forests. Along with the many plants species that the rainforest gives home to, it also provides an ample home for many animals. Such animals include species from various families, kingdoms, and species. A few of the varieties include reptiles, birds, mammals, and many invertebrates. A few example of the mammals which call the rainforest their home are primates (monkeys), felids (lions, tigers, domestic cats), and other variations. A few example of the reptiles which may be found are animals such as lizards, chameleons, snakes, as well as some species of turtles. The monkeys which inhabit the rainforest are equipped with prehensile tails which allow them the hang from the branches in the tree tops. In tropical rainforest, the largest animal groups that may be found are the insects. Some examples of the insects which may be found are butterflies stick insects, beetles, and large colonies of ants (many species). The Amazon Basin Rainforest holds the largest population of plants and animals than any other habitat or biome in the world. A biome in Southeast Asia holds the second largest population. The Rainforest in Africa, which is listed above, holds the smallest amount of plants and animals out of all the rainforests. One and one-half acres of rainforest are cut down every second with tragic consequences countries that are in need of industry and development. It is widely believed that the world is losing approximately 137 plants, animal and insect species every single day. This loss is directly due to rainforest deforestation. Rainforest covers approximately 6% of the earth’s surface, although this number is diminishing due to deforestation. 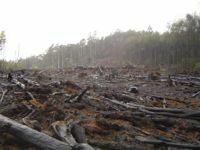 Half of the world's species of plants, animals, and other organisms will be destroyed in the next quarter century due illegal logging and deforestation. Forest floor of a Rainforest near the Skyrail, Cairns, Australia. 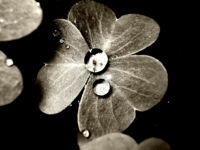 This page was last modified on 31 August 2010, at 00:09.